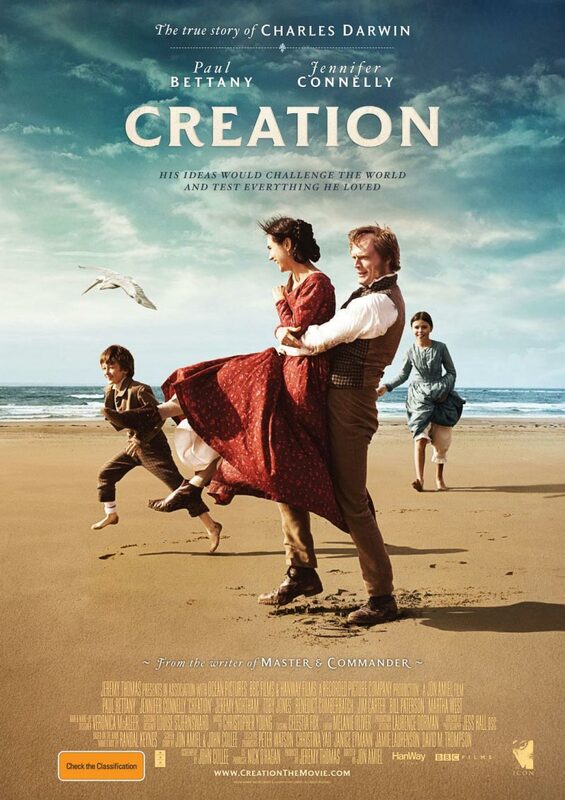 On the closing night of the Sydney Film Festival, I decided to see the Charles Darwin biopic, “Creation”. Perhaps the most thrilling part of seeing this film at this festival is that I got the pleasure of being at the same screening as screenwriter, John Collee. It was a great experience to listen to Collee speak and answer questions on the life of Charles Darwin, the research that went into writing the script and the making of the film. I think it is very easy to take for granted how much research goes into writing a script before the first words are even written, especially in a biopic such as “Creation”. The film was based on the book “Annie’s Box” by Randal Keynes, who is actually the great-great grandson of Charles Darwin himself. A great deal of the information in this book is correct, as Darwin was known for writing many a letter to his friends and family (as is shown in the movie) and he was a compulsive note-taker. Collee said of him “If he were around today, he would be an adamant blogger”. So Darwin would probably be one of the easier people to find information on for this reason, but nevertheless there is still much research to be completed before writing a biopic screenplay. I applaud any screenwriter for the amount of work they put in both before and during the writing of a screenplay. I do believe that many Christians may be weary of watching this film because of the idea that Darwin’s theories are closely linked to atheism. However, there is not too much to be frightened of with this film. There are some references from other characters besides Darwin that he is in war with God and that his book would prove the church wrong, but this is not what the movie is about. It even suggests that Darwin himself may have had doubts, but was not entirely sure that his theory meant that God did not exist. It has been suggested by many people, including today by Collee, that Darwin’s book, “The Origin Of Species” was more a way of coming to terms with his anger towards God for taking his beloved daughter, Annie away from him. It does seem quite odd that if he was an atheist, why he would be buried in Westminster Abbey in London. Or was this just a goodwill gesture upon his death? Something to be pondered. “Creation” may be about the writing of Charles Darwin’s infamous book, “The Origin Of Species”, but it is not about his evolution theories as per say. “Creation” focuses more on the relationship between Charles Darwin (Paul Bettany) and his wife, Emma (Jennifer Connelly)as they both come to grips with the death of their beloved 10-year old daughter, Annie (newcomer Martha West). Charles and Emma drift apart from each other as Emma turns to her Christian faith for comfort, while Charles stops going to church and becomes obsessed with his scientific theories of life on Earth and how it came to be. As Charles is continuously pressured by others to write his book for all those who agree with him, he feels like he is drifting further away from his wife, his children, himself and his deceased daughter. “Creation” could have been a fantastic film, but it feels like it was just done the wrong way. The main criticism of the film is that it is far too jerky and it feels as though it does not even out until the last half an hour. It is the way in which the flashback scenes are incorporated with both the present and Darwin’s dream-like hallucinations that make the film seem far too erratic. The film would have worked far better if it was just carried through chronologically. Maybe director, Jon Amiel was trying to make the film slightly more surrealistic by piecing the film together this way, but it just seems far too jumpy and the audience is not able to take their time to enjoy a scene for what it is. However, as said before, it seems to smooth out towards the end, and the last 20 minutes are just magic. They are emotionally striking and filled with some extremely fine acting. Attention must also be brought to the visuals of the film. There are many scenes which are truly beautiful and are stunning to watch. The period is very well represented in the costumes, visuals and the music. The script is very well written. The amount of research done is evident and well written into the film. The acting is what makes the film work and is definitely its saving grace. Paul Bettany gives his career best in this film. Not only does he uncannily resemble a young Charles Darwin, but he gives a heartfelt performance as a husband and father struggling with both grief and his sanity. His performance will be a tough one to watch for many fathers. The real-life married couple of Bettany and Jennifer Connelly is, as it typically is, a winning choice. The chemistry is already there and shows up on the big screen in spectacular fashion. The acting from these two is great throughout the film, but, like the film, it gets better throughout the film. For one particular scene, Bettany should win an Oscar based purely on that. “Creation” could have been a great film instead of just a good film. The jerkiness of the film is the huge downfall. A great film should be great the whole way through rather than waiting until the last quarter. However, it should be seen purely for Paul Bettany’s magic. The film takes an in-depth look at a grieving family and may strike a chord with many people who have been through a similar situation. “Creation” could have been a film about any grieving family, but is made more interesting by the family being the Darwins. Nice to read this review.I like your writing style.I'm very excited to read it.I would like to suggest this to my friends.Continue your work like this.Thank you so much for sharing this post.